Gulf Islands National Seashore offers recreation opportunities and preserves natural and historic resources along the Gulf of Mexico barrier islands of Florida and Mississippi. The protected regions include mainland areas and parts of seven islands. Some islands along the Alabama coast were originally considered for inclusion, but as of 2009, none is part of the National Seashore. 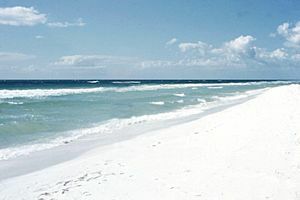 The color of the sand in the region is exceptionally white, as seen in this 1957 photo at Pensacola Beach, Florida, adjacent to the protected area designated in 1971. The Florida District of the seashore features offshore barrier islands with sparkling white quartz sand beaches (along miles of undeveloped land), historic fortifications, and nature trails. Mainland features near Pensacola, Florida, include the Naval Live Oaks Reservation, beaches, and military forts. All Florida areas are accessible by automobile. The Mississippi District of the seashore features natural beaches, historic sites, wildlife sanctuaries, islands accessible only by boat, bayous, nature trails, picnic areas, and campgrounds. The Davis Bayou Area is the only portion of the National Seashore in Mississippi that is accessible by automobile. Petit Bois, Horn, East Ship, West Ship, and Cat islands are accessible only by boat. The 4,080 acres (16.5 km2) Gulf Islands Wilderness offers special protection, within the seashore, to parts of Petit Bois Island and Horn Island, Mississippi. Considerable damage to public infrastructure occurred as a result of storms during the 2004 and 2005 Atlantic hurricane seasons. In subsequent years, infrastructure was fully repaired. All roadways, parking areas, campgrounds, and visitor centers have been repaired and are fully operational. A few trails and associated boardwalks and dune crossovers were still under repair as of late 2010, especially near the Fort Pickens campground. The national seashore was authorized on January 8, 1971, and is administered by the National Park Service. The wilderness area was designated on November 10, 1978. Four visitor centers, staffed by National Park personnel, are located within Gulf Islands National Seashore. Three are located in Florida, and one is located in Mississippi. Two developed campgrounds are located in the National Seashore. Primitive camping is also permitted in designated areas. Campground fees are posted at the "Fees and Reservations" website. In Florida, the Pickens Campground is a developed one and provides water and electrical hookups for recreational vehicles and tents. Roads are paved throughout the campground, as well as each campsite. The environment is characterized by sand scrub oaks, small brackish ponds, and a remnant pine forest on a barrier island between Pensacola Bay and the Gulf of Mexico. Central restrooms and showers are available. A campground store reopened in late 2010 (after being closed following storm damage from Hurricanes Ivan and Dennis in 2004 and 2005, respectively). There are no sewer hookups at the campsites; however, a dump station is available. Reservations can be made through the "ReserveAmerica" website from March through October. From November through February, sites are available on a first-come, first-served basis. 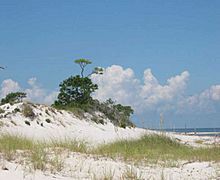 The campground is located approximately 1.5 miles (2 km) from Fort Pickens itself. In Mississippi, the Davis Bayou Campground is developed, providing water and electrical hookups for recreational vehicles and tents. Roads are paved throughout the campground, as well as each campsite. The environment is characterized by an oak and pine forest adjacent to a brackish bayou connected to Mississippi Sound. Central restrooms and showers are available. There are no sewer hookups at the campsites; however, a dump station is available. Reservations can be made through the "ReserveAmerica" website. Campsites not previously reserved for the day are available on a first-come, first-served basis. The campground is located at the end of roadway leading through the Davis Bayou Area. Primitive camping is permitted on several of the barrier islands. Boating or hiking in is required. Such camping is allowed on Perdido Key, Florida (east of Johnson Beach), and on government-owned properties on Petit Bois, Horn, East Ship, and Cat islands in Mississippi. With several islands in Mississippi designated as "wilderness areas", an unusual opportunity exists along the northern Gulf Coast for a wilderness experience. The Deepwater Horizon oil spill, beginning 20 April 2010, released masses of oil and tar which began washing ashore, in varying amounts, along the Gulf Islands National Seashore on 1 June 2010. On 23 June 2010, wave after wave of oil pools and globs began covering the beaches on Santa Rosa Island, resulting in a fishing and swimming ban. The oil-spill disaster affected every large island in the group. A variety of fees apply to various entrances and activities at the National Seashore. Current fees can be viewed at the National Seashore's "Fees and Reservations" website. Entrance fees are charged at the entrance to the Fort Pickens area at Pensacola Beach, as well as the Johnson Beach Area at Perdido Key in Florida. The typical automobile entrance fee is US$15, good for seven days. Annual passes can be purchased for US$30 . The various forms of the "America the Beautiful - National Parks and Federal Recreational Lands Pass" are accepted. There are no entrance fees charged in any other areas of the National Seashore. Gulf Islands National Seashore Facts for Kids. Kiddle Encyclopedia.